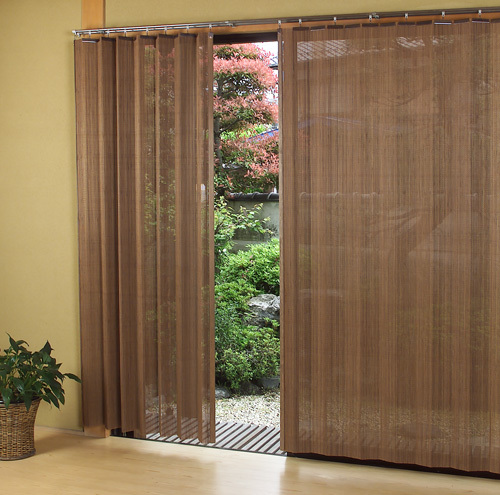 Daiko Industrial Co., Ltd. is a manufacturer of "blind (Japanese style screen)", headquartered at the banks of "Lake Biwa", the largest lake in Japan. 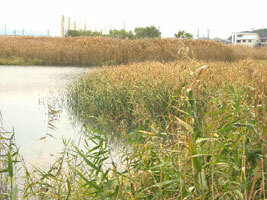 Around the lake, there are natural materials, such as reeds that grow in the rich water source of Lake Biwa. 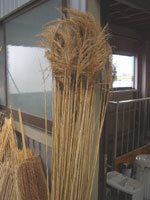 I n this reason, blinds using the reeds, etc., are eco-friendly products that are also good for people. Keeping and inheriting traditional Japanese style, and also reforming the style to fit the modern lifestyle these days, we, Daiko Industrial Co., Ltd. has produced our products. Our products are not only for exclusive shops, accommodation etc., but for stylish housing and others. Also, techniques by Daiko Industrial Co., Ltd have been highly evaluated. and they provide their products for windows of Shinkansen (the fastest train in Japan), those of the luxury sleeper trains and for others. 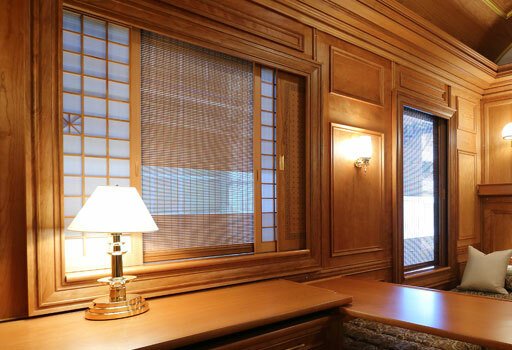 Our product, Japanese “sudare” screen can be found at windows on the Luxurious Cruise Train, “SEVEN STARS”. 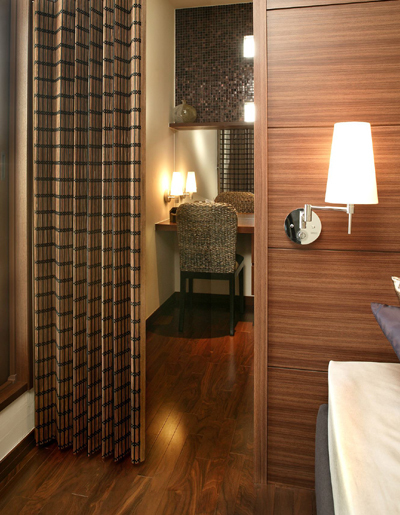 We use exclusive materials for the production and it gives new image for the journey by train. Also as for “SEVEN STARS”, we manufactured “sudare” screen not only for windows but for a wall at the observation room located at the last car. It eliminates the conventional lifting code. If we just slide up or down the handle attached to the bottom rail, we will be able to let blind lifted up or scrolled down easily. Eliminating the operation code makes possible to prevent people from accidents such as having codes wrapped around their bodies. 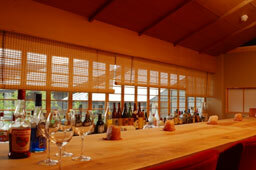 Also, it does not impair atmosphere of rooms, and has realized to keep rooms neat and to have functional beauty. This product has an emphasis Trust for Safety and Freedom from Care. 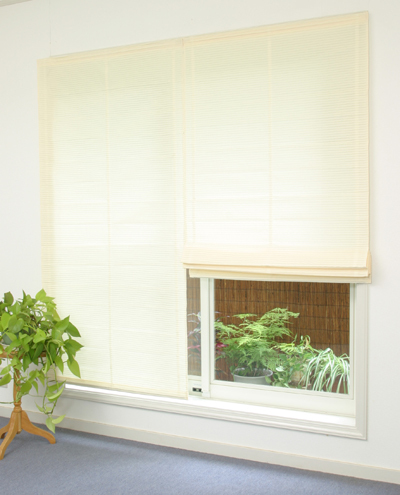 We used to attach operation codes for lifting sudare blinds, however, this product does not include any lifting codes and that makes it possible to prevent from having accidents such as being wrapped by codes around our bodies. The operation is very simple; it can be completed if the ball with a strap is to be hooked. 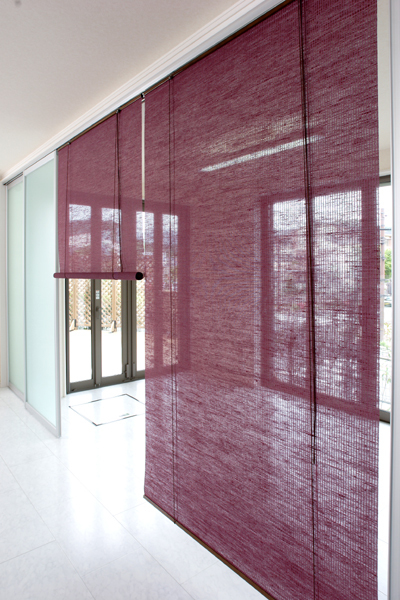 That simple action makes the blind possible to be folded to the desired height, rolled up and so on. Each piece is hand-woven by Craftsmen. This exclusive screen has twill weave at both ends for giving the strength and also features double- layered bamboo crosspiece on the top. Each piece is hand-woven by Craftsmen. 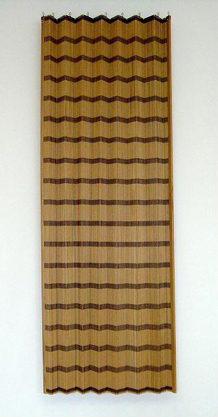 This exclusive screen has double layered bamboo cross piece on the top. 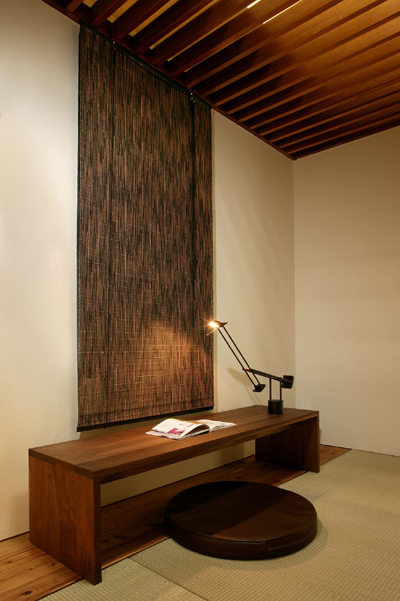 This hand-woven screen uses exclusive Japanese timber bamboo that aged 3 years after the cut. 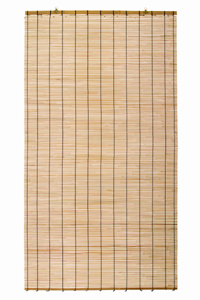 Also, this gorgeous screen features patterns by rows using surface inside and bark of bamboo one by one and arranged section of bamboo. It changes colors into beautiful light brown after usage. 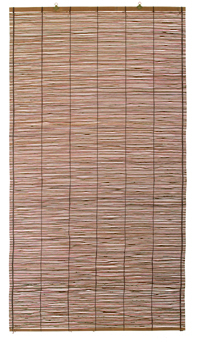 This hand-woven screen uses exclusive phyllostachys pubescens. 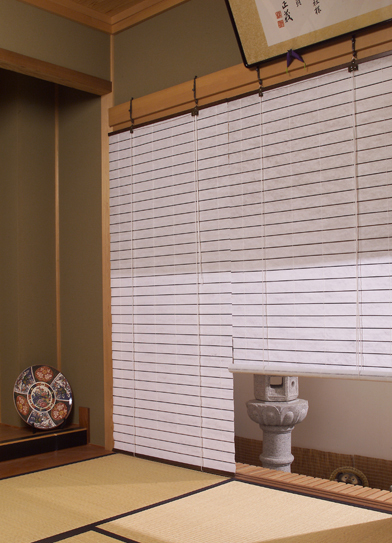 Available with reasonable price, since patterns by bamboo joints are not arranged precisely. For casual use at drawing room etc..
Weaved with strings dyed with some color graduation. Recommended for modern space. 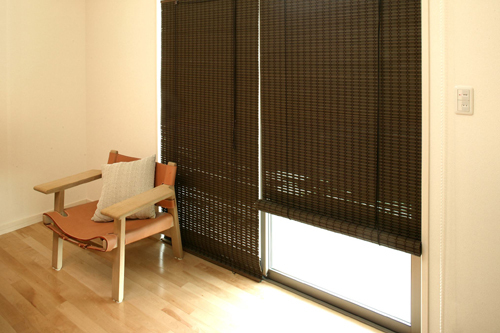 Bamboo Screen 'NUANCE' is designed to consider color scheme.Bright brown sticks are situated above dark brown ones creates three-dimensional effect by changing their color subtly. Various sizes are available. 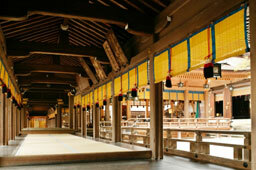 This roll-up screen, Kageboshi, can be used for interior and/or exterior. Also, it is very convenient to be able to adjust the height. ‘CALM’ has 6 color variations. The transparency brightens your room. Color is hardly faded even if used at sunny rooms. You will be able to enjoy vivid colors for long period. LUCE' has more light blocking effects compared with other hemp screens up till now. While leaving the texture of hemp, materials are used extravagantly and woven finely. Shading rate is 93% (RH-731 white). 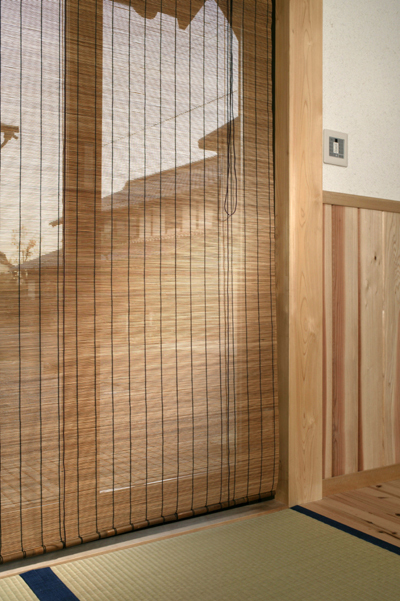 Shoji-style screen creates “Japanese space” easily. 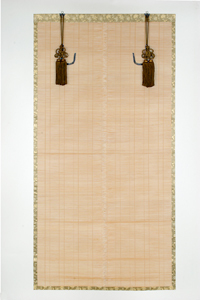 Durable than Japanese paper for the material, unwoven cloth. Easy to install for the light body as feathers. 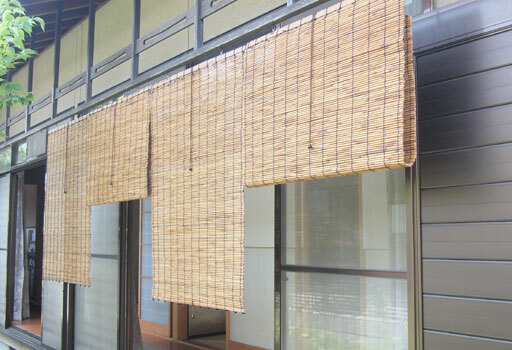 Bamboo Curtain 'SQUARE' uses angular bamboo sticks and made patterns with woven strings. That gives three dimensional effects. This screen presents stylish room. 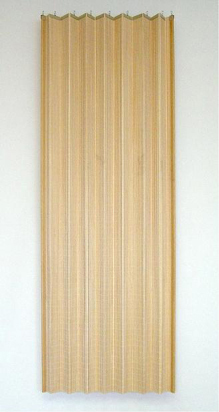 Smoked Bamboo Curtain 'B-906' uses smoked bamboo that brings composed texture. Also fumatory helps to prevent from bugs and mold. 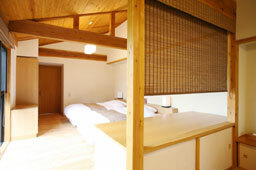 Gentle feeling on bamboo and the threading brings elegance. 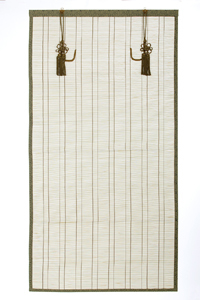 Wooden Sudare Curtain A-103 is made of Japanese Lime Tree from Hokkaido in Japan. It features photocatalyst processing decomposed organic compounds; antibacterial deodorant. Highly recommended for the natural materials with photocatalytic process. Recommended to use for partition as well. 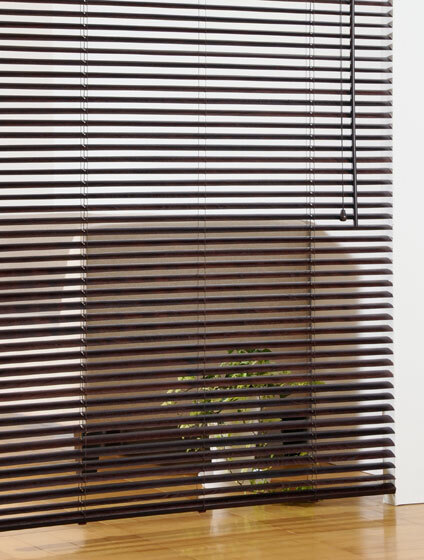 Easy to lift up and down for the Ultra-thin slats(feather) with approx. 0.8mm thin slats and approx. 30% weight of normal wooden blinds. 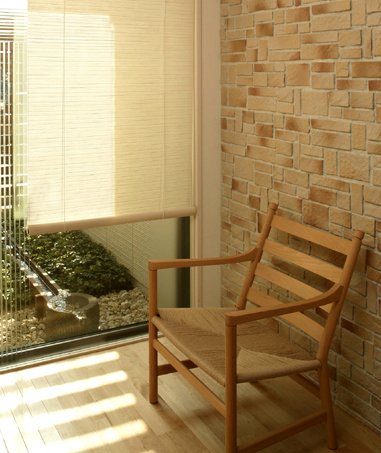 Ｕｌｔｒａ Thin and Light Wooden Blind “lerarce” features fabulous texture and strength of Japanese natural woods grew up in a cold place by hand production. 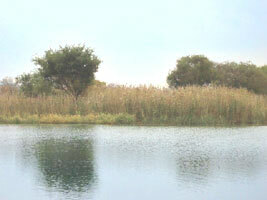 Please feel bless of nature in your room. Horizontal pleats’ lines make the impression that rooms are neat. 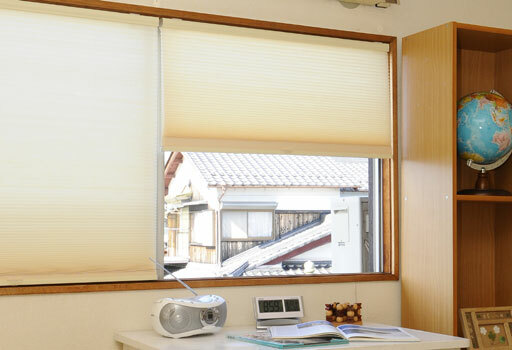 You would be able to use it anywhere you wish, since it can be installed by Velcro with adhesive tape without damaging window frames or others.